Trunks: Slender, tapering, to 3+ feet in diameter; crown oval; branches stout; bark dark-gray, shallow-furrowed, flat-topped scale-like plates. Twigs: Coarse, slender, gray-brown, downy when young; leaf scars large, shield-shaped; bundle scars numerous in 3-4 groups or scattered; buds egg-shaped, flattened, brown, downy; terminal bud larger; bud scales 4-6, in pairs. Leaves: Alternate, odd pinnately-compound, deciduous, 16 to 28 inches long; stalk 1.8 to 3.2 inches long; leaflets 7-17, firm, yellowish-green above, paler beneath, ovate-lanceolate or oblong-lanceolate, 1 to 6 inches long, .4 to 2.8 inches wide; terminal leaflet usually broadest at middle or below; lateral leaflets often sickle-shaped (1 side more curved); surfaces pubescent when young, becoming nearly glabrous; margins finely to coarsely toothed; tip long-tapering to point, often curved; base rounded or tapered; stalk of terminal leaflet 1/5 to 1 inch long; stalks of lateral leaflets less than 1/3 inch long. 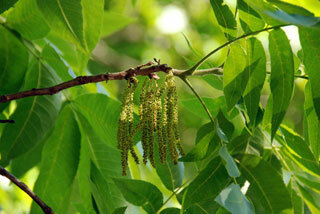 Flowers: April-May, after leaves; male and female flowers on same tree (monoecious); staminate flowers small, green, each with awl-shaped bract at base, lateral lobes broadly oblong, in drooping catkins; catkins 3 to 7 inches long, in 3s from bud's of previous year's growth; stamens 3-6; anthers large, yellow; pistillate flowers solitary or few in cluster at end of new growth, oblong, narrowed at ends, 1/8 inch long; ovary barrel-shaped, yellowish-green, pubescent; stigma 2-lobed, yellowish-green. Fruit: October-November; clusters of 3-10; ovoid-ellipsoid, 1.2 to 2 inches long, .6 to 1.2 inch wide, narrowed at ends, nut enclosed in husk; husk thin, rough, with vertical ridges; nut oblong, 1 to 1.6 inch long, light brown with dark markings, edible, sweet. Habitat: Stream banks, bottomland woods, flood plains; moist, well-drained alluvial soils. Uses: Native American stored the nuts for winter use; rubbed crushed leaves on ringworm; and boiled the bark and took the liquid to treat tuberculosis. Squirrels eat the nuts. Comments: Pecan is cultivated as a shade and nut tree. The nuts from wild trees are smaller than those of cultivated trees. There are pecan orchards in southeast Kansas. The wood is hard, brittle, light brown. It is used for furniture, flooring and for fuel. The common name "pecan" is of Algonquin origin. When the trees flower, the wind-borne pollen can cause allergy symptoms. Pecan is the state tree of Texas.